ORONO (NEWS CENTER Maine) -- After a nail-biting win against Weber State on Friday night, the Black Bears are moving on to their first FCS semifinal game in program history. "The way this team is going, I don't see why they can't go all the way," said Maine football alum and NFL veteran Mike DeVito. "Everything that's been put in front of them they've just knocked it out of the park and this is a team that had every reason to make excuses." No excuses for the Black Bears. Instead, more work. "I think it's exciting, obviously for our program, our university but I don't think any of these guys are satisfied with that," said sophomore quarterback Chris Ferguson. "You know, it's the final four, it's great, but we're in it to the end and that's all we really want to do and that's our goal." While the team heads out west again to continue their championship run, they have a strong support system back home in Maine. "It's all about pride spirit and drive and showing that pride for our school," said freshman Peter Dupuis. Dupuis is a member of the marching band that was gifted a charter flight to cheer on the Black Bears in Utah. He said it is already a highlight of his college experience. "We witnessed history. It was crazy," he said. Students and alumni alike are proud to watch this history. "Yeah, I mean whenever anything happens like this it kind of brings everyone together just because, it's our school, it's our pride," said sophomore Hannah Burns. "I'm always proud of the Black Bears. I mean you look back at what it takes to play football at the University of Maine. It's not like going to James Madison or Delaware that have all the nice weather and stuff like that. You have to be tough to come up here and play this game." DeVito added. 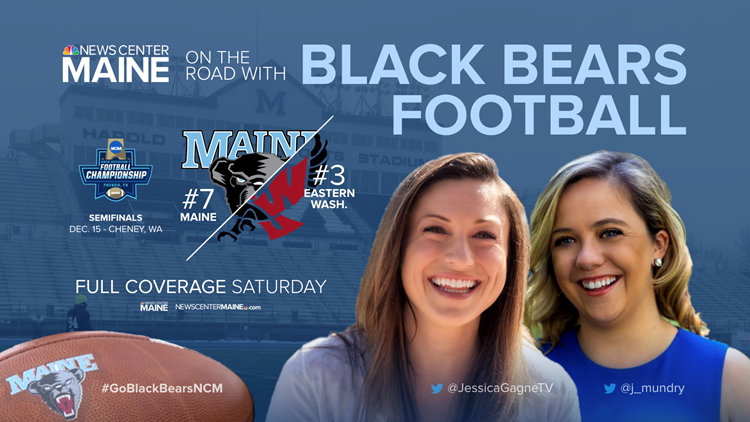 The Black Bears will take on Eastern Washington University on Saturday at 2 p.m.